Peak land surface temperatures from February 7-14, 2017, as mapped by satellite during the 2017 heatwave. January typically brings cold weather to much of the mainland U.S. and some rain to Hawaii. But in the southern hemisphere, it’s summer time. And for much of Australia, the weather lately has included broiling heat waves. A list of a few recent high temperatures in Australia staggers the mind. More than 107 degrees Fahrenheit in Adelaide — the capital city of the state of South Australia. More than 116 degrees elsewhere in the state. It’s been even worse in parts of Western Australia. Marble Bar is a town known for its intense summer heat. Last week temperatures rose above 49-degrees Celsius – more than 120-degrees Fahrenheit. That was the hottest temperature ever recorded locally — where they started tracking them back in 1901. 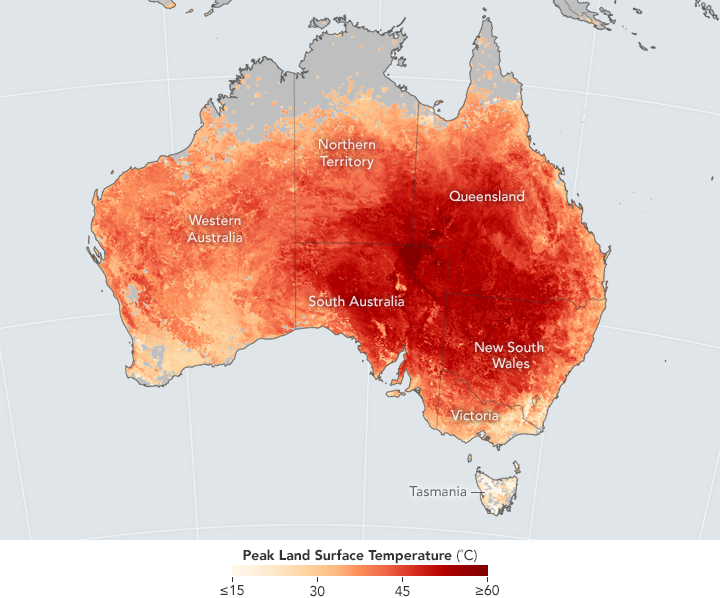 Parts of Australia, especially in the south, closed out 2018 with temperatures much higher than usual – 18 to 25 degrees Fahrenheit higher. The federal government calls heatwaves Australia’s deadliest natural hazard, and it has tracked them back to the 1840’s. Deaths from heatwaves reached their peaks in the early 1900’s, but the heat is getting worse. According to a paper in the journal Climatic Change, heatwaves in Australia are increasing in their frequency and their intensity. The Bureau of Meteorology expects 2018 will turn out as one of the five warmest years on record for Australia. Looking ahead, government forecasters expect a “warmer and drier summer than usual” over the coming months. 2018 saw another increase in the number of traffic fatalities across Hawaii. But this problem has become even worse in one Southeast Asian country – which is taking new steps to fight it.